Ron and Donetta have a love story that has to be shared. Highschool sweethearts, they’ve been married for 47 years. With their ever-present humor, they are each other’s rock through the best of times and through the worst of times. Forty-four years ago the Livesays moved to Nags Head, North Carolina and eventually settled in Wanchese, a small coastal town in Dare County so they could live near their beloved sea. Working a few jobs, mostly in commercial fishing and administration, they were living the dream. “We thought we had the best life at the beach,” Donetta says. On February 1, 2018, Ron was told to go home and settle his affairs after a routine colonoscopy showed that he had inoperable rectal cancer. Every organ in his body was “fragile” and he wasn’t expected to live very long. Donetta felt that the doctors essentially sent him home to die, yet in her and Ron’s minds, they refused to accept the dire diagnosis. Donetta sought out her friend who happened to be the wife of retired state senator Marc Basnight. After a few phone calls by the senator, Ron was admitted to UNC Hospitals for further testing. At UNC Hospitals, the Livesays were told that Ron’s cancer was not only treatable, it was also curable. Undergoing grueling yet life-saving chemotherapy and radiation treatments, Donetta tells us that “UNC saved my husband’s life. 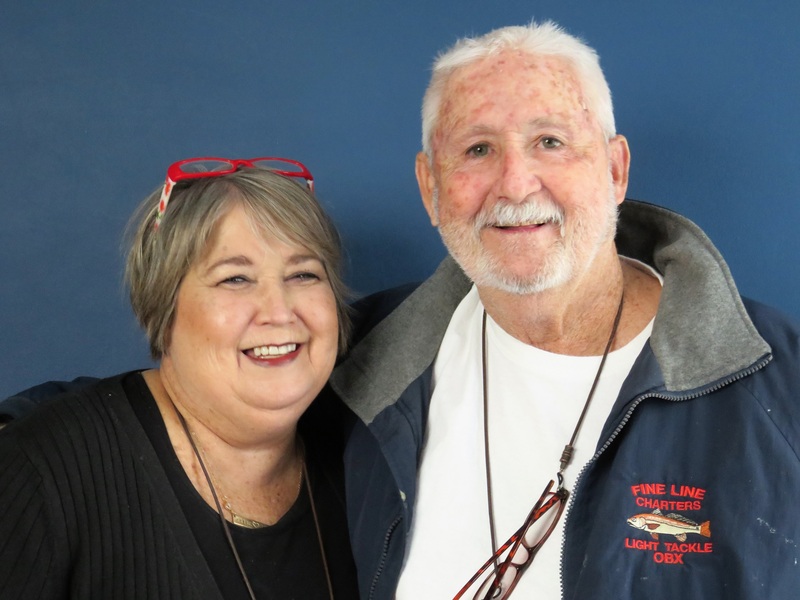 They all work like a team.” During seven weeks of treatment, Ron and Donetta were guests at Family House, spending long days at the hospital before returning in the evenings for hot meals prepared by our many volunteer meal providers. One of the unexpected and delightful surprises to come out of the Livesay’s recent stay was that a crew from the National Geographic-owned television show “Wicked Tuna,” came out to Family House on a recent weekend to do a piece about them. It turns out that Ron and Donetta’s son, Matthew, happens to captain one of their fishing boats. When he told the show’s producers about his dad’s illness and stay at Family House, they were quick to do a story about them. The piece not only showcased the excellent medical care Ron received at UNC Hospitals, it also gave Ron and Donetta an opportunity to speak about their stay SECU Family House and how it positively impacted his road to recovery. It’s said time and time again that Family House “represents a community of people.” It is that community of volunteers, staff, donors, guests, and former guests that “fuels our operations” and allows us to have a positive impact on so many families like Ron and Donetta who grace our hospitality house every day of the year. While the impact is at times immeasurable, one only has to speak with a single guest to know that our mission of serving families is accomplished 365 days a year.